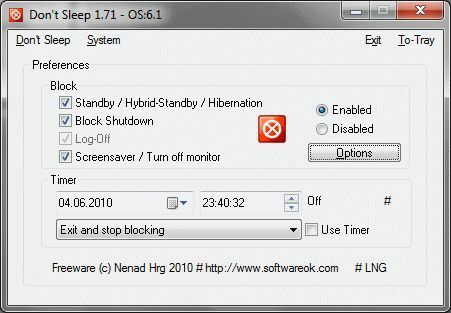 Dont Sleep is a tool you can use to prevent your PC from turning off. It will allow you to stop system functions such as going into standby, hibernation, rebooting or shutting down - short of a power loss of course. It will also prevent users logging off, and will stop screen savers from being displayed, or the monitor being switched off. You can pick and choose which of these options you want, if any. Dont Sleep is a portable application and so does not require an installation.